About an hour and a half's drive from Cape Town on the coast near the town of Vredenburg is a quaint little seaside village called Jacobsbaai. Its not far from all its neighbouring villages (about 15 minutes by car) but is rather isolated sitting on the coastline all by itself. The land on which the village has sprung up is situated on a two kilometre stretch of coastline and includes some beautiful sandy bays as well as some very rocky outcrops. 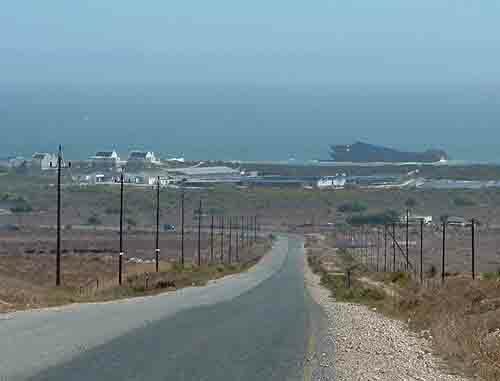 The road down to the village from Vredenburg or Saldanha Bay is tarred but once you get into the village of Jacobsbaai all the roads become gravel. The purpose of the gravel roads in this small village is to keep the speed of traffic down and the pace of life slow. 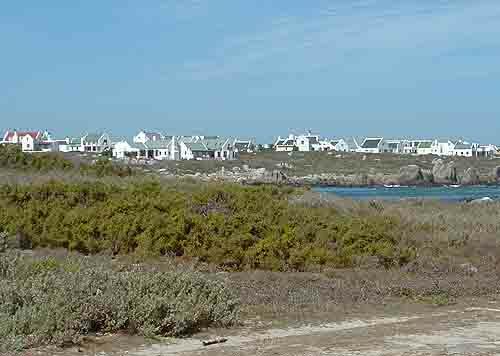 So how did Jacobsbaai come to be situated where it is today? History tells us that during the early 1800's a company called “ Stefan Bros” conducted trade along the west coast and when a local farmer became indebted to them they took over his farm on a 99 year lease holding basis as a way to pay off his debts. There was also a more sinister reason for the company to take over farms along the coastline. In those days properties along the coastline had landing rights owned by the leaseholder and by controlling the landing rights other merchants could be stopped from entering the area from the sea. The land where Jacobsbaai is located must have changed hands on a number of occasions over the years , but in 1984 it came into the possession of Nic Tredoux, a man, well known in the advertising and copywriting industry. He was also a writer of many books and a poet of note. Nic Tredoux started the original development of Jacobsbaai on his land using his own private funds but when his health started fading he went into partnership with Kuron Holdings. Nic has his own ideas as to how the village should look and feel and he had them incorporated into the building regulations that were to be laid down for the village. A problem that he had and possibly inherited from the time of the Stefan Bros was access to the beaches. As is usual in developments on the coastline, plots along the beachfront and coastline are the first to be sold and no allowance is made for the public to gain access to the beach. Nic Tredoux fought tooth and nail to keep access to the beaches on his stretch of coastline open to the public. The hotel in the village is built on the coastline on an outcrop of rock. On one side is the sea and on the other side is a beautiful beach lined by a sand dune. As a visitor to the area one was afraid to follow the pathway between the properties built on the sand dune because of the number of warnings that the property was private property and that you were trespassing. In the hotel grounds certain areas were either gated or chained off making it very difficult to reach the beach and the shipwreck in the bay beyond the hotel. The question I ask is why should people either live in Jacobsbaai or take the time to visit this out of the way place. The village has laid down strict building codes which are strictly adhered to. All houses are painted white with limewash and most of them have a modern Cape Dutch design. 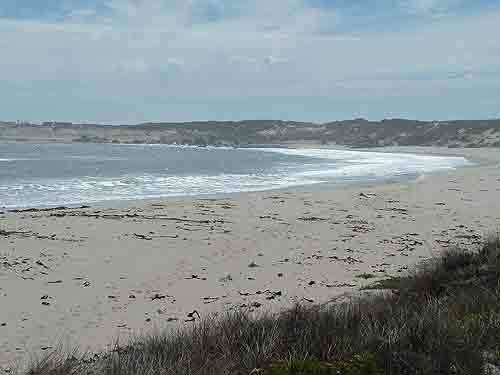 The coastline where the village has been built boasts seven beautiful bays known as Kwaaibaai which is popular with surfers, Jacobsbaai, Smalbaai and Moerie se baai which are great for launching boats from and Bamboesbaai and Toothrock which are excellent for people who love water sport. For fisherman the village offers safe boating, fishing and diving and an abundance of fish, crayfish and abalone. There is actually something for most people who visit the village. For those who love hiking there are a number of coastal trails to be explored. For nature lovers Jacobsbaai is a popular whale watching venue and for birdlovers there is a large variety of birds living in the area. As there are no fences in the village one cannot make gardens, but if you did chances are that they might not last long due to visits from local wildlife such as rabbits, partridges, guinea fowl and a whole host of other small creatures living in the area. Other than the hotel , the restaurant and a small shop there is no other commercial activity in the town. If you are visiting the village and have forgotten to bring something with you the chances are that you will have to visit the larger towns to purchase what you need. Jacobsbaai being part of the Cape's Floral Kingdom boasts a large array of wildflowers every year during late winter and early spring when the dry and dusty veld becomes a floral wonderland. It's a sight to behold and a must for anyone who has not seen a natural flower show. Not only are there a lot of flowers common to the West coast and the Western cape growing in the area but there is a large concentration of threatened plant species. 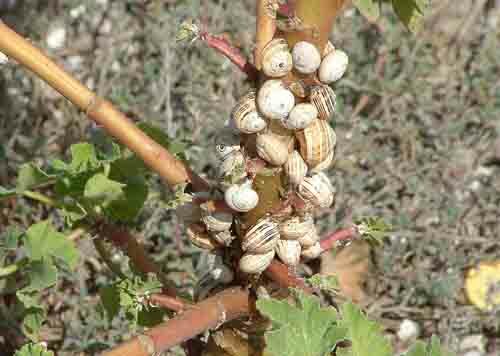 The vegetation in Jacobsbaai is predominantly classified as Langebaan Dune Strandveld and Saldanha Limestone Strandveld both of which vegetation types are regarded as threatened in terms of the South African National Biodiversity Assessment. Other than all the natural attractions in and around Jacobsbaai nature saw fit in 2009 to add another attraction to all those already there. 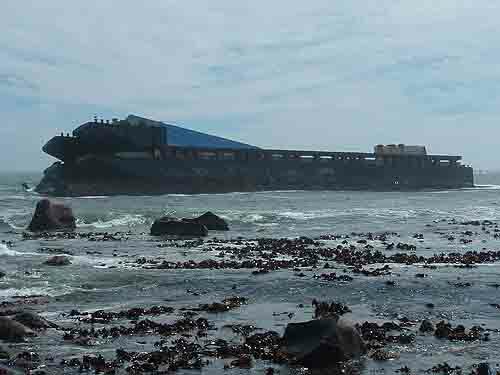 In June 2009 a barge which was carrying twelve river barges on its decks got caught in a major storm off the coast of Jacobsbaai and broke its tow rope and ended up on the rocks about three hundred metres from the local hotel. On arrival the barge called Margaret looked like a large parking garage.with its five levels of barges. Since its arrival about nine months ago the upper decks of the wreck have been blasted clear allowing some of the undamaged barges on its decks to be salvaged. The pieces of the wreck which could not be salvaged have been left for the elements to take care of and hopefully form a submerged artificial reef. For those who love the great outdoors, peace and quiet and sand and sea Jacobsbaai is the ideal place to have a holiday.